The hockey world has lost another member this sad summer - Wade Belak. This one hit hard as he was a Maple Leaf and I actually had an encounter with Belak in downtown Toronto. He wasn't a Leaf at the time after being traded to Florida, and we let him know he was greatly missed in Toronto (the Leafs were pretty soft at the time and Don Cherry agrees). Wade said that he missed Toronto and shook our hands with his big mitts before taking off from the stool he was sitting on - which we immediately sat on to say we've sat on the same stool as Wade Belak. A fan favourite on the ice for his role as an enforcer, Belak could also bring the fans to their feet with his rare goals. Some may remember Belak more so for his personality off the ice as he was a real character - just watch the Wade A Minute features Jody Vance did. One of my favourite things Belak always did was call into the Dean Blundell Show on The Edge radio station. He was always hilarious and that is the same place he made the "I wouldn't piss on Sean Avery if he was on fire" comment. Belak was set to skate on Battle of the Blades this September which would have been amazing as Belak is a 6'5" 220lbs giant. Perhaps Belak's shining moment in Toronto was when he revenged Tomas Kaberle, and the Maple Leafs for Cam Janssen's late hit on Kaberle. Be prepared to get chills when the Toronto fans chant BEE-LAK! BEE-LAK! BEE-LAK! It is so sad. I loved listening to him on The Edge, such a funny guy. Something has to be done with all these tough guys dying. It must be all the pain killers they are taking. Let me just say something, a lot of the guys on here know I'm a die hard Red Wings fan, but I absolutely loved Wade Belak. I remember watching that game against New Jersey live, and I was chanting "BE-LAK" on my couch. I really was. 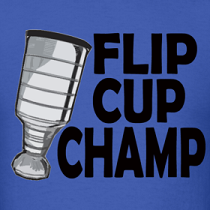 I even got him in one of my NHL Be A GM Mode's and he won the cup with my Wings. I only wish he did win a cup, the man really deserved it not just for who he was on the ice, but who he was off of it. P.S. There is a radio interview up on TSN.ca/nhl right now with Georges Laraque, and it really gives you a good degree of detail about what the life of the enforcer is all about. Everyone should listen if they can. that was a very very good interview with laraque brad.